Run by the welcoming Mr Win, The Park Ayutthaya is the only place to stay within the main Historical Park. Ad Book now! Rates from US$33.13++. Average rating 7.9 from 612 reviews. Wat Phra Si Sanphet is a 10-minute walk to the north and Wat Mahathat is within view to the south, making this a top pick if you want to stumble out of bed and into the ruins. It’s also an excellent choice if your primary concern is good-quality accommodation. A bona fide bed and breakfast in our book, The Park occupies a peaceful property with an outdoor terrace and dining area surrounded by flowers and low-hanging mango trees. The top-end rooms are set in an attached single-floor row of polished concrete with a modern feel. 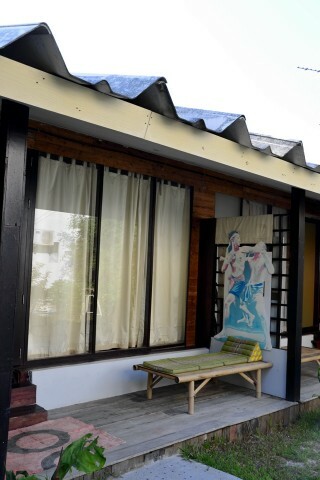 Images of famous muay Thai fighters decorate the large private terraces with comfortable sloped wooden loungers. These rooms are fronted by nearly wall-size glass windows and outfitted with hardwood floors that give way to a slightly raised sleeping space with good-quality beds. All rooms come with free WiFi, LCD TVs, fridges, desks and daybeds with Thai-style pillows. The only odd bits are bathrooms which, while spacious and clean with partitioned showers, are separated from the rest of the room by concrete barriers with no actual door. Cheaper rooms set on the upper floor of an old house were full when we visited; we were told that they’re similar but a little smaller and without the balconies. Family rooms are also found in there somewhere. A big advantage of staying here is the super-helpful and friendly owner, who pays close attention to detail and goes above and beyond what we generally expect from flashpacker-range hotel staff. He cooks up the included breakfast, often incorporating some of the fresh mangoes that collect on the property. If The Park is full, head to the nearby Baan Kong Homestay or Tamarind Guest House.